represent luxury beach vacation rentals. Call today for more information. Accomplishing The Impossible Want a private meeting with the pope? Need an elephant for a personal parade? Creations World Concierge company can make it happen. There’s no request they can’t fulfill. Modeling Creativity True to its mission, Lux draws different types of artists from all over the world to live on location and use the facilities to create art. From painters to sculptors, Shaw chooses a wide variety of artists for each season. Chiseled Life Working mainly on a large scale, Armstrong creates impressive wood sculptures that have adorned public places such as hospitals and airports, private businesses and churches, and prestigious homes. Like a Rock Created by Paul Johnson and executive sushi chef Robert Cassidy, the menu at Sushi on the Rock is ambitious and all encompassing. They infuse different spices and flavors, but keep it simple. New in Town Keep up with San Diego County’s latest additions and changes to the local business scene. Home Decor Trends Need some decorating ideas or some interior design inspiration? Then look no further! FINE magazine brings you the latest in home decor trends. A Weighty Issue With so much information and misinformation about hormones and health, it can be difficult to separate fact from fiction. LETTER From The EDITOR It’s a question that has plagued artists and critics for centuries: What is art? What links a cave painting, the words of Shakespeare, the pirouette of a dancer and the sharp planes of a modern sculpture? Art has united and it has divided—yet through it all, it has remained a decidedly human endeavor. Poet Amy Lowell defined art as “the desire of a man to express himself, to record the reactions of his personality to the world he lives in.” Throughout history, we have sought visual and verbal symbols to articulate our hopes and our fears, to communicate the core of our individual and collective beings. Art has chronicled our past, and it shapes our future. In this issue, we celebrate artistic expression, both near and far. We take a look at furniture designer Rebecca Justice’s custom collection, and admire the craft of master wood carver J. Chester “Skip” Armstrong. We explore Lux Art Institute and peek inside Art N Soul on 101, a non-profit gallery that donates its store profits to local charities. And we tempt your palate with the artful dishes served at Sushi on the Rock. We hope you enjoy this tribute to our local expression. Book Signing September 13th 1:00 p.m. - 4:00 p.m. Brooke Giannetti Interior Designer to the Stars. Brooke Giannetti is Designer and creator of the popular “Velvet and Linen” blog, and Steve is one of the most sought after architects in Southern California. Refreshments will be served. COME VISIT OUR 6,000 SQ. FT.
ENCINITAS WAREHOUSE 565 Westlake • Ste. 300 • 760.944.5244 Tuesday through Friday • 10:00 a.m. until 4:00 p.m. or by appt. San Diegoâ&#x20AC;&#x2122;s New Gateway to The World. carlsbad to laX 7 times Daily On weekdays with convenient worldwide connections. NOW aVaiLabLe: User fee customs service from 9:00am to 5:00pm for international flights. SALES INQ UIRES 7 6 0 - 9 0 8 - 5 7 2 9 s a l e s @ FINEs d . c o m E DITORIAL SU B M ISSION e d i t o r i a l @ FINEs d . c o m FINE M EDIA O F FICES 7 7 0 R a n c h o Sa n t a F e R o a d , E n c i n i t a s , CA 9 2 0 2 4 FINE magazine is your source for high-end luxury, lifestyle and living. We target more than 40,000 affluent readers in print and an additional 300,000 digital recipients each month. 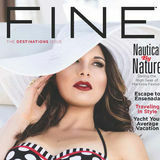 FINE magazine is your guide to the newest developments, the most exclusive places and the latest trends in FINE dining, art, jewelry, wines, fashion and real estate. Our distribution covers San Diego County. We currently offer a Microsoft Tags and QR-code options on selected listings, products and services, so across the country, day or night, you can instantly access additional information right on your smart phone. Through a variety of marketing programs, our publication takes you everywhere from behind-the-scenes of VIP San Diego events, to the cutting edge of luxury living and the people who define it. The owner of EA Brown Studio, Ed has expanded on his master’s degree from the New School of Architecture and Design with his studio work, where he brings the same intuitive understanding of lighting and sense of compositional harmony to capturing countenances. Ed’s eye and skill for direction make him an able capturer of time’s transient moments. Sarah is an English major at Biola University, where she writes for The Point, her university magazine, and edits The Inkslinger, its literary journal. She is excitedly planning her first European trip to explore the sights of England, Ireland and France after graduation. A writer for 15 years, Machel writes her own newspaper column in Rancho Santa Fe called “Machel’s Ranch.” Her articles have appeared in several magazines and newspapers in Southern California, and she is also a copywriter for various luxury companies in San Diego. Machel resides in Cardiff-by-the-Sea with her husband and her son. Laura is a full-service stylist who creates beauty from all angles, including hair and makeup artistry, creative fashion direction and styling. Her expertise and fashion-forward style developed through years of industry experience and continuing education. Laura is best known for her complete A-Z beauty services. Meet San Diego’s latest additions. We’re about to tell you the secret to perfect skin. The Secret – A Skin & Vein Laser Clinic, a specialty center for the ultimate in skin rejuvenation and vein disorders, just opened. The new office in La Jolla uses the latest technology to treat sagging skin, sun damage, acne scars wrinkles, as well as varicose veins and spider veins. Encinitas recently welcomes 2Good2B, an allergen-friendly bakery that offers delicious gluten-free breads, desserts, pizzas, sandwiches and other tasty baked goods. This bakery brings flavor and excitement to gluten-free dishes, attracting more than just the gluten-sensitive to its counters. Its menu is also free of corn, corn syrup and soy. Since its recent grand opening, The Craftsman New American Tavern has already become a new hot spot in Encinitas. Featuring exquisite “hand-crafted comfort foods,” this place has pasta dishes, tasty burgers and local craft beers on tap. Head on over for happy hour, starting at 3:30 p.m.
A new venture in Encinitas, Stone Flats gives pizza a new meaning, focusing on simple and pure ingredients. Diners craft their own flatbread-style pizzas, served alongside soups, salads and breadsticks. Food-lovers will love indulging in their own flatbread masterpiece, often prepared in just five minutes. 6989 CORTE LANGOSTA - CARLSBAD, LA COSTA RIDGE Stunning Monterey Ranch style home in exclusive, gated La Costa Ridge for sale! This 5 bedroom, 5.5 bathroom home sits at the end of a quiet cul de sac & features private entertaining spaces, plus your own custom putting green. Greet guests in your private interior courtyard w/granite bar, loggia & fireplace. Gorgeous upgrades abound, including: natural stone floors, wrought iron staircase, stainless steel appliances, upgraded cabinets & granite counters, mud room, plantation shutters, four fireplaces, fire ring... did we mention storage galore & immaculately clean? WOW! Samuel Scott one of the best places to work in San Diego. tailor the residential loan process to fit each individual client. and taking an honest approach to every transaction. and loan professionals, contact Russ Schreier, vice president of sales, at 858-436-1187 or russ@samuelscottfg.com. Samuel Scott Financial Group is licensed by the CA Dept. of Real Estate, Real Estate Broker License 01458652 and NMLS 235584. Equal Opportunity Lender. All rights reserved. ©2012 Samuel Scott Financial Group. Accomplishing the Impossible Creations World Concierge crafts exclusive memories for its elite clientele. planning the ultimate vacations for her clients. “Right now I’m working with a couple families planning a trip to Italy, arranging four- and five-star accommodations, private tours of the Vatican and a private meeting with the pope,” Steen explains. Steen chuckles when she recalls a memory of getting elephants for clients visiting India: “It was a family with four children that we arranged a private villa for in India. During their stay, we acquired two elephants from the prince. The four children painted the elephants and placed flower leis on them and had a traditional Indian parade.” With these kinds of memories, it is not hard to see how clients remain so loyal to Creations World Concierge, where no stone is left unturned in accomplishing the impossible. For more information on Creations World Concierge, visit sdcreations.org. FINE Jewelry trends Here are the latest jewelry trends to hit SoCal. Find out what to buy and where to get it. and you will be enchanted. 1237 Prospect Street Suite B - LA JOLLA 1. Alluring amethysts totaling 62.72 ct. cradled by diamonds in 18 kt. white gold, $3,999 each. 2. Tantalizing Tahitian pearls accented with diamonds in 18 kt. white gold, $3,999 for the set. 3. Mouthwatering 4.77 ct. triangle aquamarine framed with diamonds in 18 kt. white gold, $3,999. Need some decorating ideas or some interior design inspiration? Then look no further. FINE magazine brings you the latest home decor trends from ceramics to closets and from beds to shovels, we have items that are sure to get your creative wheels spinning. Coffee Table A one of a kind hardwood & laser cut marble coffee table with brass accents. Building what you envision, or helping you create a vision to make your home or office the Entry Residential Cherry Buffet Cabinets, and integrated wood columns with Solid Wenge inlays. Modulare Divani Sectional fully custom & made in the U.S. in under 4 weeks! Sleek, stylish & most of all comfortable. Without Alpine Stained Glass itâ&#x20AC;&#x2122;s just a door. Bellini Antique Italia Importing fine Italian Furnishings, of superb quality and craftsmanship from Tuscany to Venice. Create a regal environment with a renaissance style decor, or a home of sleek sophistication with mid-century modern. For authentic Italian ambiance, come to Belliniâ&#x20AC;&#x2122;s Antique Italia. Web: belliniimports.com Phone: 858-509-9399 Deruta Ceramics Once sought after by rich merchants and noblemen for their creative and qualitative excellence, hand painted Deruta ceramics are deservedly popular among many for their home decor. is individually selected by founders, Maria Barry and Cindy Cerenzie. Web: ledimora.com Phone: 858-759-2709 Castellina Bed The Castellina upholstered bed shown at Le Dimora is the perfect transition between old world styling and the new clean lined look that have been very popular. A perfect transition for Rancho Santa Fe. the most out of your bedroom space. Virtuoso Closet The Virtuoso Collection from California Closets brings contemporary, European style to any space in any home. Its strong horizontal lines and rich LagoÂŽ Italian finishes make a dramatic statement in any space where a clean, modern look of a luxury closet is desired. This linear system, free of vertical partitions, is as sturdy as it is contemporary and striking. Awards and Recognition •	2012 CLCA 1st. Place award for Small Residential Construction Excellence in Design Build. •	2012 CLCA 1st. Place Award for Design & Installation Excellence in Low Voltage Lighting. •	2012 CLCA Landscape Beautification Achievement Award for Small Residential Renovation Excellence •	2012 CLCA Landscape Beautification Achievement Award for Design & Installation Excellence in Low Voltage Lighting. •	2010 & 2011& 2012 Voted Best Landscaper in San Diego by KFMB Mojo Pages. •	2011 CLCA Statewide 1st. Place Award for Best Landscape Renovation Project. •	2011 CLCA 1st. Place Award for Best Estate Landscape Renovation Project. •	2011 CLCA Landscape Beautification Achievement Award for Small Residential Construction Excellence in Design Build. Skylar’s Home & Patio Located in the village of Carlsbad Skylar’s offers a wide array of home furnishings. in addition to its elite positioning as a pioneer creator. Roche Bobois launches an exclusive new collection every six months and proudly ranks among the most talented furniture brands with an upscale international reputation. of selections for indoor and outdoor living. and specializing in custom sectionals and sofas. “Oliver” Mid Century Modern Sectional Made local in less than 2 weeks with available Fabric Options. Impac Mortgage is a direct agency seller which means you can expect great programs, extremely competitive pricing and fast service. San Diego’s finest coastal collection of stores in a beautiful outdoor shopping center. Cartier’s phoenix-shaped wristwatch at $2.7 million. Other pieces stand by their technical merits, such as Frank Muller’s Aeternitas Mega 4, with 36 complications, at $2.7 million. Louis Moinet’s new piece, Meteoris, is a $4.6 million set of four tourbillion watches, made using four meteorites from space and comes with a planetarium of the solar system. FINE discount available when you mention this ad! ARE YOU A San Diego based company, entrepreneur or marketing guru? WE WANT YOU to be featured on Channel 4 COX Cable this October. Twelve of San Diego’s best companies and sixteen sales and marketing contestants will star in an eight episode television program, The VP Sales Contest. It will showcase entrepreneurism, small businesses, marketing strategies, while providing jobs and stimulating thousands of dollars for the San Diego economy. nearly 15 years ago. But Lux staff is eagerly anticipating the 2013 move further down the hill to the new Education Pavilion, equipped with more lecture and studio space, offices, storage and labs. “We have that bursting-at-the-seams kind of feeling,” says Madamba, who looks forward to the opportunities the extra space brings, such as serving more students through field trips and after-school classes. While the classes take place in the education pavilion, the studio itself is not an official school. Instead, children and adults watch artists work, and, through their time in residency, artists complete one or more pieces. This gives visitors the chance to learn from a professional, developing their own techniques, picking up pointers or just admiring the skill. When asked if it is possible to teach creativity, Shaw says: “That’s exactly what we’re doing at Lux.” If you would like to contribute to Lux’s expansion, or are interested in checking out the new artist-in-residency, visit luxartinstitute.org. The museum, located on South El Camino Real in Encinitas, is open to the public from Thursday to Saturday. Sculptor Susan Graham kicks off the fall season on Sept. 6. Lively Terramar Beach Living - 4 lots from the Pacific Ocean. Prominent, elevated lot affords terrific panoramic views Approximately 3,200 square feet, plus approximately 800 square feet of bonus space Elevator stops on all 3 levels. City park close by. Extension awnings off kitchen and master suite Travertine flooring, new carpeting, stainless appliances vacant lot to the south available with, as well, call for details. Available as a package or potentially separate. Miles of ocean views! More affordable than you’d think! City maintained park across the street. A nice stroll to the village of Carlsbad. Close to upscale outlet shopping, Legoland and more. Master suite with retreat and office comprise entire top floor. Extra lot is improved with fruit trees, palms, olives and ornamental landscaping. Trust owned. Seller says SELL! Let me show it to you! Former Street of Dreams home - “The San Gimignano,” features custom European doors which open onto private terraces with a natural rock pool, spa and waterfall, coupled with lush, mature landscaping and a prestigious circular motorcourt at one of the highest elevations within this guard gated exclusive community. On a clear day you can see all the way to Catalina Island. Approximately 5,700 square feet of luxury and privacy. Quartzite flooring, a great room kitchen/family/media/bar plus butler’s pantry, secret pantry plus gym. There is a generously sized guest suite located the main level. Upstairs is a 3 chamber master suite with fireplace, balcony, huge bathroom with limestone and granite flooring, has a large skylight, mitered glass shower enclosure, spa tub, 2 walk in closets. Additionally, upstairs there is a library, storage and two additional en-suite guest bedrooms. This decorator’s own home has been a lightly used vacation property and can be sold “turn-key” furnished. Come see for yourself the natural beauty that this estate provides. Ultra private, cul de sac location. Lightly used second home. Such a pleasant surprise. Let me show it to you! This Page Top David: Robert Graham shirt from Mister B. TBM pants and Borsalino hat from Mister B. Rebecca: Escada jumpsuit from Maggie B and Emilio Pucci scarf from Maggie B. Jewelry and sunglasses from StyleStudioSD.com. Decor: Outdoor hand-forged iron double chaise lounge with sunbrella fabric cushions. home was lovingly and painstakingly designed by Justice. “I would say that I discovered that, really, your dream home is you, and that’s where your family resides,” she said. “Every wall, every art piece, every console is me.” And an appreciation of each piece requires an understanding of Rebecca Justice—the designer, model and mother. Justice, the Designer In 2007, Justice had just finished building her dream home. Unlike other professional athletes, the Justices hadn’t built the perfect home in each city David Justice had played. Instead, they saved all their money to build the ultimate home in San Diego, where they chose to live after David retired. But the 2007 wildfires razed all of the Justices’ hard work. This Page Left Decor: Hand-carved dining table with egg and dart edge, accented with hand-carved Roman-replica pedestals. Gothic dining chairs with hand-forged iron medallions, accented with fleur de lis finials. This Page Top Right Rebecca: Olvis top and pants from Maggie B. Necklace and earrings from Artisans Jewelry. Decor: Hand-carved master bed with open carved medallion on headboard. Accented with cherub pillars. This Page Bottom Right Rebecca: Jiovani dress from Mia Bella, shoes from Steve Madden. Ring, necklace and earrings available at StyleStudioSD.com. Marie: Jiovani dress from Mia Bella. Jewelry from StyleStudioSD.com. Living Lifestyle Luxury The Justice of the Piece This Page Left Decor: Poker table designed for David Justice, with personalized initial in center. Custom-made drapery inspired by European cathedrals. This Page Right Rebecca: Jiovani dress from Mia Bella. Bracelets and earrings from StyleStudioSD.com. Decor: Hand-carved bench. and from that, it has developed into a great friendship as well as a business relationship,” recalled Cunning, who has been designing and manufacturing furniture in San Diego for 30 years. “The Rebecca Justice Collection is like no other in the industry,” Cunning continued. “You would need to go to the old castles of Europe to find something similar.” Indeed, in developing her ornate pieces, Justice studied Spanish décor, European chateaus and cathedrals, and Tuscan villas. Her signature style is marked by fleurs-de-lis, crosses and crowns. “It’s a lot of royal inspiration,” Justice said. “There is a Spanish-Mexican flair in my attraction toward furniture. I love things that look distressed and old-world, especially growing up with a lot of that religious, spiritual art all around.” One of Justice’s favorite pieces is her entryway piece, a circular, hand-carved sofa with an angel at the center. Rosaries that were blessed by the Vatican hang from the angel’s hand. This Page Rebecca: Jovani dress from Mia Bella. Bracelets and earrings from StyleStudioSD.com. Decor: Hand-carved chair replica of Louis XVI, accented with 24-karat gold leaf. that we are involved in. My parents live with us, and my husband is around—and he’s a hands-on father. I have a lot of partnership.” In the future, Justice said she plans to focus on expanding her collection, especially her outdoor patio furniture, and delving more into her accessory line. She’s also considering fashion apparel. However, her focus remains on her family—both now and in the future. “I don’t just have my dream home,” she said. “I have my grandchildren’s playground. I built this for the future.” For more information on Rebecca Justice’s Villa de Justicia Furniture Collection, visit rebeccajusticecollections.com. Would you stake your company’s reputation on next month’s results? We would. professional sales person within each of us is infectious. he personalizes the training to your specific business. Sandler Training is a world leader in innovative sales and sales management training. For more than 40 years, Sandler has taught its distinctive, non-traditional selling system and highly effective sales training methodology, which has helped salespeople and sales managers take charge of the process. Our training is designed to create lasting “performance improvement” rather than the motivational “quick fix” typical of many seminarbased training programs. To help you accomplish your goals, Sandler provides “reinforcement training,” a system that combines quality materials along with access to ongoing training workshops and individual coaching sessions. Sited in an enclave of ten executive homes in a gated community overlooking the sparkling blue ocean this home and its location will appeal to a discerning Buyer. A large lot and mature landscaping provide privacy. As you walk through the entry gates a splash of colors dazzle the eyes with the mature plantings - yellows, reds, pinks and the soothing sounds of a fountain. An open floor plan with soaring ceilings, exposed beams and ocean views from most rooms provide California living at its best. The home has recently been upgraded with quality finishes including quartz and hardwood flooring, granite countertops, three custom fireplaces, two patios, security system, and glass tiles. The downstairs encompasses two bedrooms, two baths and a sumptuous Master suite. All three bedrooms open to the outside overlooking gardens, fruit trees and a Spa. An upstairs office or additional bedroom and a fourth bath, living room and dining room and a great room with kitchen, eating area and family room are all generously sized. A wrap around deck offers outstanding ocean views to La Jolla. In addition, there is a large detached recreation room (or office) with wall to wall windows and lots of storage. This room is attached to a 2 car garage. Call of the Wild Donna Bernstein captures the beauty of the urban equine. Storm King 36 x 39 inches Acrylic, ink on paper Available as giclee print on paper or canvas. Oceanfront Property with Island Contemporary Architecture. Large parcel with 2 homes & 2 garages for 4 cars. Completed in 2006, this home consists of the ﬁnest natural materials & craftsmanship, from the thick quartzite pavers, unique Rain Forest Marble to the rich hand-carved mahogany banisters. The well-designed ﬂoor plan frames the view of the ocean from within & La Cantina doors open walls to the outside entertainment area. Hidden solar panels save energy while maintaining aesthetics. The Nova Era Conductor Jung Ho Pak discusses exciting changes at Orchestra Nova San Diego. reflected this revolutionary and new idea. Second, a nova is a star that burns brightly. music that transports the soul. was both high quality and immensely popular. my personality as I can. has the same kind of excitement in their eyes as if they’re meeting a pop star. It means that with the music of Mozart of Tchaikovsky, I’ve connected with them on a level that reaches their souls. Also, if I conduct with abandon and risk, it lets the musicians know that it’s also safe for them to do the same. In the end, I hope the audiences leave with the sense that they experienced something intimate and emotional—and smiled along the way. For more information on Orchestra Nova San Diego, visit orchestranova.org. GLOBAL. NATIONAL. LOCAL. YOU. Suzen Sarko of Realty Connex and Eric Jones of Urban Real Estate Services have announced their new company Harcourts Pacific Realty. Founded in 1888. Harcourts has 788 offices in 10 countries with $20.9 Billion in Sales last year. Their retention and earnings per Agent are way above Industry standards with agents averaging $168,000 per year. Harcourts International president Mike Green will be launching their luxury division in the U.S. October 2012. Harcourtsâ&#x20AC;&#x2122; people oriented culture brings old fashion values, with powerful tech tools, and the worldâ&#x20AC;&#x2122;s best training. Crafted by Jim Ford this single level home sits on 1.69 acres in the desirable gated community of River Estates in Rancho Santa Fe. With over 9000 square feet this home has it all including: a chefs kitchen, guesthouse, library, theatre, wine cellar, wet bar, dramatic loggia, 6-car garage, 9 dramatic waterfalls and picturesque views from nearly every room. Superior quality and details throughout with distressed exposed beams, natural stones, travertine, marble, onyx, granite, intricate moldings and cobbled pavers. Amazing light and drama from the walls of windows and large disappearing lift and slide doors. Recurring jaw pain and headaches could be caused by TMD. f you suffer from reoccurring or chronic migraines or pain in your jaw, neck or shoulders, you may have temporomandibular disorder—or TMD for short. This condition has multiple causes, and there several treatments available ranging from conservative to aggressive. As the owner of Adriatic Dental in San Marcos, I have many patients with various forms of TMD, which is also sometimes called TMJ. TMD can be a tricky issue to manage because it presents itself in so many different ways, it can be mistaken for other conditions and it has a wide variety of causes. TMD has to do with inflammation or injury surrounding the temporomandibular joint (TMJ), which is the hinge joint that connects your jawbone to the rest of your skull. The TMJ is what allows you to open and close your jaw so that you can speak, laugh and chew your food. The joint is very flexible, and when it’s working, you probably never even feel it. Pain or tenderness in the jaw, face, shoulder or neck, often in the morning. Pain when yawning or speaking. Mild to severe migraines, often upon waking in the morning. A stuck or locked jaw Clicking or popping sounds when chewing or opening or closing the mouth. When attempting to diagnose symptoms, a dentist will take a thorough medical history from the patient. They will perform an exam, testing the patient’s TMJs for pain or sensitivity, observing jaw movement and listening for clicking or popping. The dentist may even take X-rays or an MRI to help with the diagnosis. Causes While a lot of factors cause TMD, the most common causes are: •	Grinding or clenching the teeth (called bruxism), which often occurs at night during sleep. modification techniques, or undergoing dental treatments such as crowns, bridges or braces. Instead of braces, I sometimes recommend a DNA appliance, which you can learn about in a separate video on that topic. Other treatments are transcutaneous electrical nerve stimulation (TENS), triggerpoint anesthesia injections and radio wave therapy. For the most serious cases, the dentist may have to refer a patient to an oral surgeon to perform one of several different available surgeries. If you or someone in your family is suffering from symptoms consistent with TMD, see your dentist right away. You can call me with questions at 760-591-3434 or visit our website at healthygumsandteethnow.com. Or stop by Smiles By Valentina, located at 4313 La Jolla Village Dr. in La Jolla (across the way from Wells Fargo) or Adriatic Dental located at 960 W. San Marcos Blvd. in San Marcos (close to Restaurant Row). You can find relief from headaches and recurring jaw pain. Contact us today at (858) 888-0457 valentinadds.com. Stunning views of Del Mar and the Pacific Ocean. This elegant home is like new inside and out with high quality and designer finishes, top of the line appliances, glass mosaic tiles and a master suite that may have the best views found in the city. The recent renovation just completed this July 2012 included plastering the exterior to a smooth finish and adding 1400 square feet of cultured stone and trim, new pool and spa, front and backyard landscaping with lighting, new air conditioning and more. This is the perfect hillside getaway with privacy, 5 bedrooms including an attached guest suite, an office and exercise room. You are welcomed at the top of the drive with a stately Canary Palm and colorful flowers throughout. A must see! Balancing the Famous five hormones helps to fight fat. five important hormones that we all make naturally every day. unwell, and they are all thrown off balance when the body has too much fat. designed to hit us right where it hurts: aging and weight gain. organs themselves (think “fatty liver”)—is the most dangerous. Cortisol is a stress hormone produced by the adrenal glands that are located on top of the kidneys. Cortisol plays a major role in metabolism and is the key player in the fight-or-flight response critical to survival, especially in escaping from a predator… such as a tiger. In our present-day lives, cortisol is secreted when we are cut off in traffic, receive notice our company is laying off employees or watch violent television shows. Chronic or long-term stress increases levels of cortisol, which causes weight gain and makes losing weight more difficult. Cortisol increases fatigue and decreases testosterone in both men and women, leading to muscle loss and a slow metabolism. Cortisol stored in fat cells deep in the abdomen—visceral fat—stimulates more weight gain. Leptin Also called the “fullness hormone,” leptin is responsible for signaling our brains to tell us we are full from eating. Leptin, which stimulates hunger receptors in our brain, is produced mostly by our fat. The level of leptin in the body is directly related to the amount of fat we have. Leptin levels also increase with an increase in insulin levels. The problem arises when the body becomes resistant to leptin because of chronic overeating. When this happens, it takes more and more leptin for our brains to know that we are full. When we gain fat, our bodies create more leptin, but we become resistant to its effects. High-fructose diets can also induce leptin resistance because the brain doesn’t get the signal to stop eating. Think of the supersized sodas. It can be difficult to drink 20 ounces of water at one sitting, but why is it easy to drink a 20-ounce soda with a super-sized hamburger and french fries? Leptin is screaming “I’m full!”—but no one is listening. our old bad habits took years to develop, but new and healthier habits will take us a long way in maintaining our vitality. Sushi on the Rock has something for everyone. San Diego’s culinary community delivers an array of stunning dishes to appease your appetite. From fivestar French cuisine, to fresh seafood, to casual comfort food and everything in between, San Diego’s chefs are cooking up some of the best food found anywhere. Try something new this week by selecting from our FINE dining guide. At Bluefire Grill in Carlsbad you can sit either indoors or on their outdoor patio amidst the warm glow of a romantic fire pit, fountains and live music. A distinctive fine dining restaurant fused with a creative culinary team, make West Steak and Seafood, Carlsbad’s most sought after reservation. At Twenty/20 Grill & Wine Bar in Carlsbad, the menu features daily specials made with fresh organic ingredients from local farms and purveyors. hAPPY hOuR eVeRYdAY fROM 5:00P.M. - 6:30P.M. Rancho Santa Fe Delicias has been serving San Diego for over 19 years and has long been known as one of North County’s favorite dining spots. For fifteen years, we’ve been proud to serve traditional California cuisine in a comfortable setting overlooking the Pacific. Open for lunch, happy hour and dinner daily. Brunch on weekends only. Qero restaurant serves up a delightful menu of Peruvian and South American entres. The service is well rated and the menu is filled with a vast variety of dishes. Enjoy a great dinner with friends and family at Sushi in the Ranch. WIth a low noise level and large menu it’s the perfect location for a private outting. del mar Addison Restaurant 5200 Grand Del Mar Way San Diego, CA 92130 (858) 314-1900 www.addisondelmar.com The Beach House features “Top of the House”, an exhibition seafood grill and oyster bar with live entertainment and a fantastic happy hour. Sbicca has been a prominent fixture of leisure life in Del Mar, serving traditional California cuisine alongside a comfortable and welcoming attitude. Enjoy wonderful food in a second-to-none-setting at the Chart House. Request a window seat and have your evening sparkle as the sunsets. CRUSH Italian Cuisine offers the highest quality food in a unique and inviting atmosphere. Their staff is both friendly and accommodating. wine. FOOD. NOVEMBER 14-18, 2012 Experience love. At first bite. Join us for a culinary love fest as the San Diego Bay Wine & Food Festival returns. One week-long extravaganza, 100 celebrity and local chefs, 200 wineries, spirits and breweries... and lots of love. Must be 21 or older to attend. No infants or children admitted. Produced By: Fast Forward Event Productions-www.fastforwardevents.com. Funded in part by the San Diego Tourism Marketing District with City of San Diego Tourism Marketing District Assessment Funds. ablo Picasso once credited art with washing “away from the soul the dust of everyday life.” And one gallery in downtown Encinitas has mastered this cleansing ritual, using the proceeds from art sales to benefit local charities. Showcasing the distinctive talent of local artisans, Art N Soul on 101 is a visual treat, housing impressive, yet accessible, creations. The gallery boasts an eclectic display of one-ofa-kind pieces, including hand-crafted jewelry incorporating antique watch pieces into pendants, clocks fashioned from vintage vinyl and whimsical sculptures designed from recycled materials. Forged with imagination and ingenuity, the pieces combine aesthetic quality with environmental consciousness by using reclaimed materials. Though the art alone is enough to warrant a visit, Art N Soul’s partnership with the community is equally engaging. In 2007, co-founders Cindy Blumkin and Paige Perkins declared that the gallery was not-for-profit. After artists receive commissions for their work, the remainder of the proceeds is donated to local charities. Blumkin and Perkins, who keep the store running along with a staff of volunteers that shares their commitment to the local art community and to the charities that benefit from their efforts. Retirees, high-school students and local artists make up the volunteer staff that allows Art N Soul to donate proceeds to local grassroots organizations. In 2007, co-founders Cindy Blumkin and Paige Perkins declared that the gallery was not-for-profit. local seniors live in poverty, and Angelâ&#x20AC;&#x2122;s Depot supplies many of them with well-balanced meals. It also acts as a community outreach program that informs the public of the dire needs of many seniors who are also â&#x20AC;&#x153;struggling to maintain their dignity and independence.â&#x20AC;? Finally, many services of Ranch Coastal Humane Society remain unseen. In addition to animal adoptions, the organization also acts as a safe house for pets that are victims of domestic violence. It also has special senior adoptions and hosts Pets for Patriots, which offers adoption discounts to military personnel and continuing-care discounts with local veterinarians. These are just four sectors that have been touched by the ongoing efforts of Art N Soul, a gallery dedicated to washing away the dust from the soul of the local community. Art N Soul hosts quarterly public events introducing the artists, and presents selected charities with their donations at the end of the year. For more information on the gallery, visit artnsoulon101.com. 5 1.) The beautiful set up at the SummerFest Gala. 2.) Cho-Liang Lin (SummerFest Music Director) and Yura Lee (SummerFest Artist) 3.) Gary and Jean Shekhter (hosts) and Chifford Schireson (Board President) 4.) Susan Snow, Glenn Bourgeois, Katherine Kennedy, Debbie Turner, John Hattox, Kathryn Hattox, Frank Alessio, Fiona Tudor, Conrad Prebys. 5 1.) First Place winners—Ryan Dohrmann, Michael Harvey, Garth Krieger, Forrest Reardon 2.) Kevin and Jolane Crawford, Kim and Jim Grant 3.) Stephen Krasnoff, Stuart Fearnley, Jim Duvall, Linda Alessio 4.) Neil Buckeridge, Kathy Karpé, Darrell Stuckey 5.) Casa de Amparo Executive Director Sharon Delphenich (center) with Second Place winners, former San Diego Chargers players Dokie Williams (left), Pete Shaw, Willie Buchanon, Sammy Seale. What is Plasma (PRP) Face Lift? ingredients from your own blood regenerate skin and rejuvenate collagen with enriched platelets, stem cells and growth factors. these platelets release special growth factors that actually heal and regenerate new cells over a period of time. Guaranteed Rate Party at the del mar racetrack Guaranteed Rate held their client appreciation party in style at Del Mar Race Track. Guests enjoyed a spectacular view of the races from a celebrity suite with 50 attendees and trusted advisors. Experience the Undiscovered Valitarâ&#x201E;˘ is a high energy, gravity defying show performed under a 45,000 square foot Big Top Tent featuring over 25 performers and 45 horses of several breeds. Valitarâ&#x201E;˘ combines advanced technology, high-energy and ethereal mystical moments enabling the crowd to be immersed in a spectacular event you must see to believe! The 36th Annual Gala: Monte Carlo on Screen is hosted at the Museum of Contemporary Art San Diego. Sept. 1-30 Taste of Hope is a food and wine celebration that raises money for City of Hope research. Call us today to learn more about our loan programs! Loan approval is subject to program guidelines. Not all loan programs are available in all states for all states for all loan amounts. Interest rate and program terms are subject to change without notice. To learn more about U.S. Bank products and services visit www.usbank.com. Mortgage products offered by U.S. Bank National Association, Member FDIC. 010311-5920 PUR4. Sept. 14 Urban Campout 2012: A Space Odyssey benefits the Girl Scouts of San Diego. Sept. 21 At the 18th Annual Festival of Beers, enjoy a live music while sampling from over 60 different breweries. Sept. 30 AIDS Walk San Diego helps provide muchneeded resources to HIV/AIDS service organizations. Sept. 26-30 Enjoy new independent film – narrative, documentary and shorts – from around the world.